Kevin McGann, CEO, Surgio Tracking materials and supplies in any industry can be demanding, but hospital inventory needs are rarely as cut and dry. Patient needs are complex and specific, a one-size-fits-all approach is inconceivable, and unavailability of the right instruments at the right time can have fatal repercussions. A study by NCI Consulting Group reveals that at any given time, the average 350-bed hospital has roughly $2 million in clinical supply inventory in its operating rooms alone. Surprisingly, up to 30 percent of the inventory is not in the item master. Truth be told, most healthcare institutions still rely on manual processes and visual inspections to manage the inventory coming in from distributors and manufacturers, resulting in lack of visibility and traceability of products. Moreover, poor asset management in hospitals is overwhelming as it equates to expensive overstock, stressful emergency purchases, and loss of precious time in tracking inventory. In such a scenario, creating a win-win solution for suppliers, manufacturers, and hospital administrators is complicated. However, Surg.io is setting a new benchmark in hospital inventory management through its one-of-a-kind surgical case management solution. Surg.io was designed by industry veterans with over five decades of experience in orthopedics, who bring an in-depth understanding of the acute challenges that burden healthcare. To draw a bigger picture, Surg.io is a cloud-based software platform that functions as a sales tool for orthopedic distributors and manufacturers, as well as a client relationship manager for hospitals to effortlessly keep track of all contracts, surgery procedures, and inventory flow. It is essentially a robust tool that is guaranteed to drive efficiencies, reduce waste, and spend. In the case of healthcare organizations, at the onset of every project, Surg. io works with hospital executives, department managers, and nursing staff to identify their current needs and challenges. At this point, the company drills down to the gaps in workflow and accordingly a business plan is formulated. In the case of a multihospital system, Surg.io implements an appropriate solution across all the hospital’s branches. The platform has the ability to integrate with an institution’s existing infrastructure and is completely scalable and flexible. Owing to this, users can leverage best practices in no time as they have access to analytics and trends, which helps in laying the groundwork for certain standardization. “Our ultimate aim is to innovatively transition the ecosystem of a healthcare institution to effectively track inventory, produce greater ROI, and save time,” says Kevin McGann, CEO of Surg.io. Whether a hospital’s inventory is owned, consigned, or loaned, Surg.io is a comprehensive tool that tracks each instrument as well as capital equipment in real time. For seamless visibility of assets, the company can utilize RFID to monitor, measure, and validate equipment statuses continuously when it’s moving between departments, operating rooms, or sister facilities. Starting with the delivery status and date of supplies, ensuring that the sets are complete standards are met, and a quick check of the expiration date. The solution takes care of all movement of inventory within a hospital set up and operating room. “For example, the platform provides complete information on whether a loner tray coming into an operating room has been processed or if the right instrument was processed by the sterile processing department (SPD),” explains McGann. Moreover, during routine checks, a hospital has instant access to the current position of inventory—underutilized equipment, excessive or redundant resources. Detailed visibility into all cases and instrument usage alongside enhanced traceability reduce the chances of duplicate or misplaced equipment, resulting in cost efficiencies. The ingenuity behind Surg.io does not stop at instrument tracking. After a healthcare facility is onboard, the company compiles all of its suppliers’ inventory data into the Surg.io platform, following which, appropriate workflows are set up. All hospital pricings are preloaded into Surg.io, and this ensures that the amount for any specific use case is automatically populated. Being a SaaS-based platform, information can be updated on the fly, which ensures that data is always current and up to date. 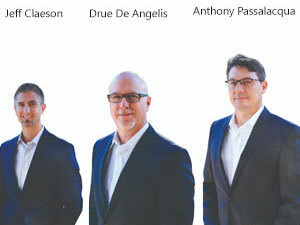 “You have the ability to trace product lot numbers, create a usage sheet, and complete billing procedures that is signed off by the lead staff and electronically transmitted to an OR director,” explains the company’s COO and Co-Founder, Drue De Angelis. Through it all, the solution not only eliminates the possibilities of losing handwritten documents or labels falling off a sheet but also fast tracks processes and reduces errors. For the maximum benefit of customers, Surg.io also allows users to run reports and view analytics on all aspects of a business. “While most solutions offer preset reports, we understand that no two hospitals have the same analytics need. We work closely with health systems and customize our analytics to deliver best-in-class results,” states McGann. 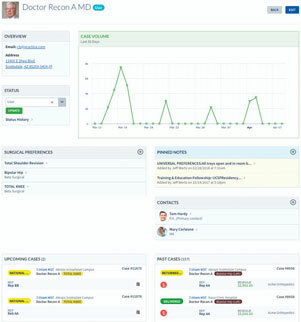 A powerhouse for intelligent data, Surg.io also functions as an interactive system for manufacturers and securely links procedures and hospital personnel to an organization’s medical reps.
Additionally, distributors and their reps have the ability to create profiles for surgeons where in addition to contact information, they can add surgeon preference cards, notes and internal comments for case activity, upload and attach pictures, and view or download files anytime, anywhere. 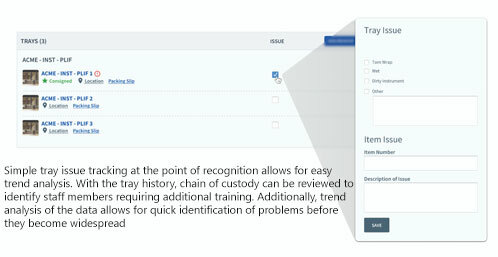 The solution also comes with a scheduling component that notifies medical reps when cases are scheduled and updated, which enables timely inclusion of essential medical equipment such as tubs and trays, seamless planning and preparation, and identification of any inventory needs. 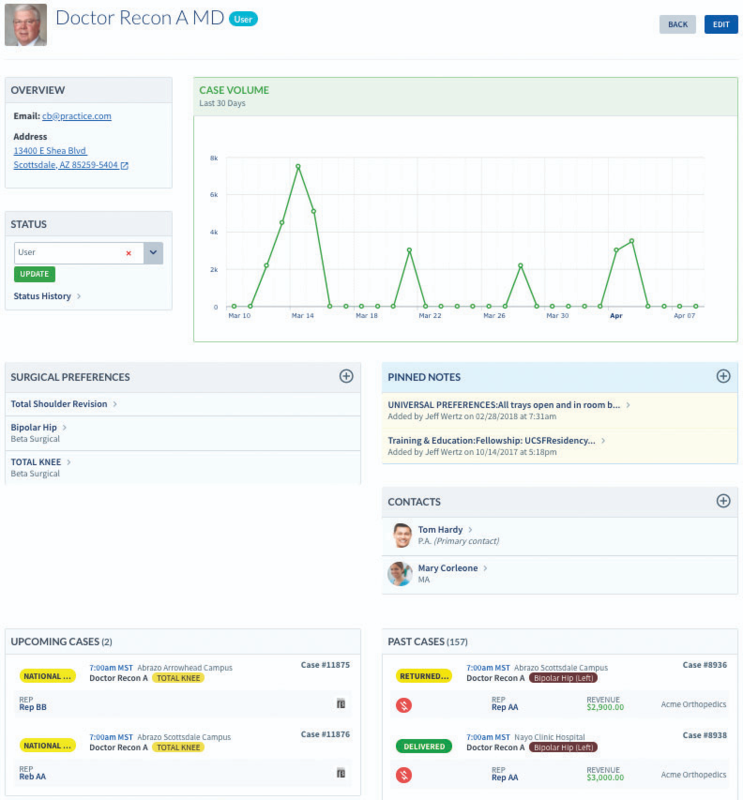 Within the Surg.io, users can view and update case information even when a device is cut off from the internet. Furthermore, the system is fully HIPAA compliant and employs a cloud infrastructure with leading-edge security protocols, data encryption, and audit controls. On observing the breadth of Surg.io’s capabilities, there is no denying the fact that it leapfrogs most other products in the market with focus on user experience, state of the art functionality, and adaptability. To highlight Surg.io’s efficiency further, the company is currently working with a client to streamline their break/fix model. As a solution, Surg.io has created a dashboard to track individual equipment that has been damaged and have been sent out for repairs. The system gives an updated account of the status of tools, the exact time it came back from repairs, and its current position within a hospital. “We can tag the equipment through our RFID capability, which brings in full visibility into the system,” adds McGann. The solution also provides actionable insights to figure out which equipment has the tendency to need more repairs and the cost associated with those repairs. "While most solutions offer preset reports, we understand that no two hospitals have the same analytics need. We work closely with health systems and customize our analytics to deliver best-in-class results"
The core of Surg.io’s competency can be largely credited to its pool of expert and qualified professionals. The company comprises developers that have experience in working with renowned technology organizations and more importantly solution strategists that have in-depth knowledge of software implementation. Surg.io’s unique blend of human resources works passionately to improve the company’s solutions day after day with a deep understanding of what clients need. Currently, the company is expanding their team, driven by the goal to refine their solutions to be more user-friendly and more intuitive than typical healthcare software. In addition, the company is also continuing to expand on the hospital-based component, focused on SPD and central supply. This comprises software that will help health systems directly benefit from inventory management. 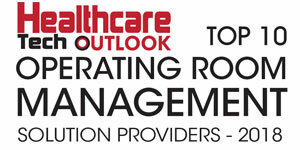 Another focal point is to help hospitals effectively integrate with their member hospitals. Plans of expanding nationally are also on the charts. “We are largely focused on our three channels—manufacturers, distributors, and hospitals—and will leave no stone unturned to help them radically improve efficiencies in the inventory management arena,” ends McGann.